Grub Customizer is a new graphical GRUB2 settings manager. 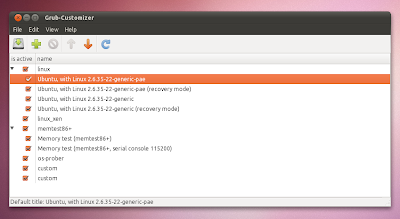 For now, it only allows you to edit the GRUB2 menu entries: reorder, rename or add/remove entries. Since these are actually scripts which generate the boot.cfg file, Grub Customizer changes the actual script order and then generates a new boot.cfg so if you then run "sudo update-grub", your customization won't be overwritten. Even though these are very basic operations, such a tool is very welcome since most GRUB 2 options lack a GUI for easy tweaking. Further more, Daniel Richter, the Grub Customizer developer plans to add more features in the future, like GRUB 2 recovery functionality for Live CDs or configuring the /etc/default/grub preferences. To download the source code or report a bug, see the Grub Customizer project page @ Launchpad. Update: Grub Customizer (stating with version 1.1) now supports BURG too! For another GUI tool for managing GRUB 2 (but with a different set of options), see StartUp Manager.